An employee of a car model factory in China understands the sorts of things gearheads like, because the unknown employee just leaked a photo of a model of the 2016 Volvo V90, Volvo’s return to the sort of premium wagons they’re known for. It looks pretty good! Actual size is expected to be much larger than handheld. It appears the model was manufactured in China for the French car model company Norev. 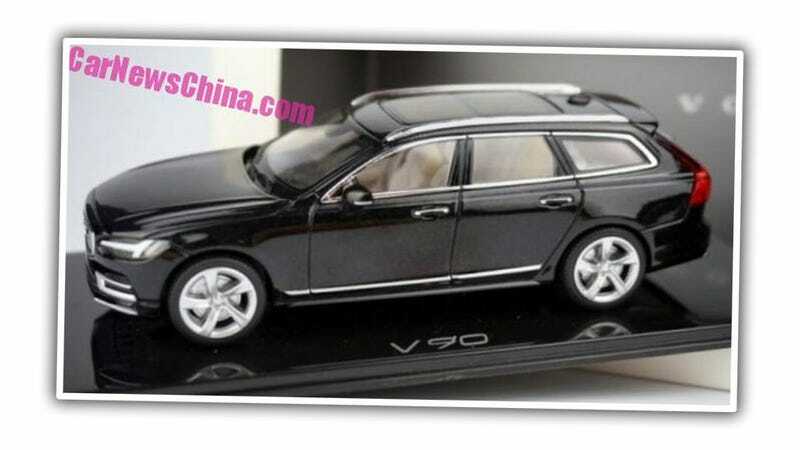 We are sure that Volvo ordered 2000 models of the S90 sedan at Norev, who outsourced the job to a Chinese toy maker. It seems reasonable to expect Volvo ordered 2000 V90 Estates as well, and apparently at least one of those was stolen, and ended up on the interwebs. Volvo hasn’t had an executive car called the V90 (or, for the sedan, the S90, which was also leaked as a model a bit over a month ago) since the late 1990s. The new V90 — at least if we trust this model which, to be honest, I think I do — has a lot of design cues from Volvo’s Concept Estate which they showed at Geneva in 2014. The essential design vocabulary and details (such as the striking T-Bone headlights and the dramatic snaking taillights) are clearly from that car and Volvo’s new design direction, but the four doors and overall scale are clearly targeted at a premium, executive market. The model shows some interesting details: a full-length panorama roof appears to be an option, as well as chromed roof rails/roof rack system, an above-rear-window spoiler, and two-tone door handles. Where’s the tow hitch? Or the cage divider thing behind the back seat for the huge dogs that will end up back there once these get to the US? I’m glad to see Volvo taking some making some bold moves into the high-end wagon market, a market which they helped to really define. Big Volvo wagons are the sorts of cars many of us are happy to see more of on the road, so hopefully Volvo will be making some of them that can’t fit on a desk very soon.